This year, Assumption is excited to escape to the beautiful land of Italy as we celebrate “That’s Amore”. 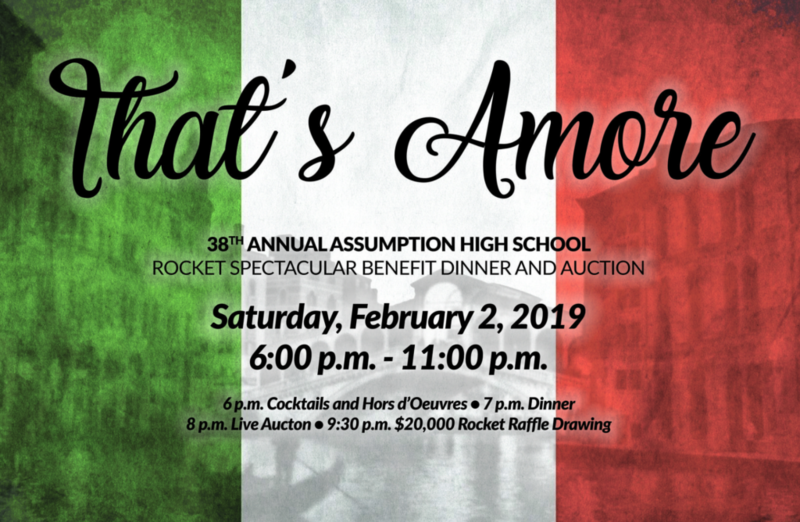 The Annual 38th Rocket Spectacular Benefit and Auction will be held on Saturday, February 2, 2019. Last year, the event welcomed over 425 guests and over 100 volunteers in addition to an unbelievable amount of support in helping to advance the mission of Assumption. We need your continued efforts in helping us pull together Assumption’s big night with donations! We appreciate all you do! The deadline for donations is January 18, 2019. Use this link to access the Rocket Spectacular event page. Below are several ways that you could help us in preparation for Assumption’s largest fundraiser. To purchase a ticket for the event, make a donation or purchase your Rocket Raffle ticket, click here. Please include a completed donation form below with your donation.